My dark eye circles seemed to be taking a turn for the worst these days. 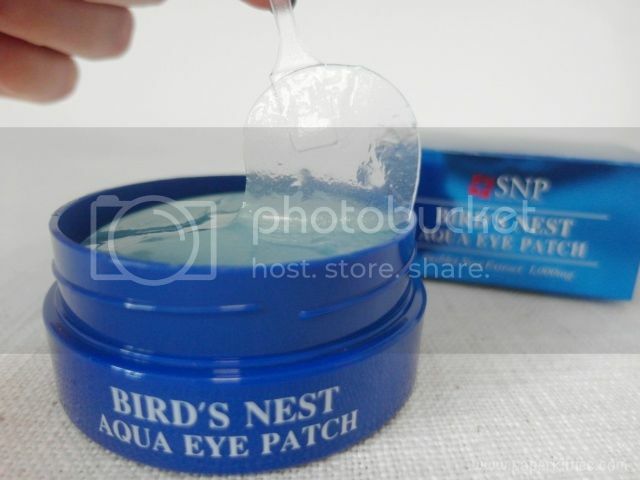 No amount of eye creams/eye masks/concealers seemed to be able to conceal this darkness seeping through my peepers 🙁 Naturally, desperate me would gladly accept any eye treatment that comes along the way and so SNP Bird’s Nest Aqua Eye Patch came just in time for me in April’s BNT beauty box. whee! SNP Bird’s Nest Aqua Eye Patch contains 1,000mg of swiftlet nest extracts and hydraulic acid, making it 200 times more nourishing than royal jelly! It also claims to help promote collagen creation, improve skin’s brightness and moisture retention. 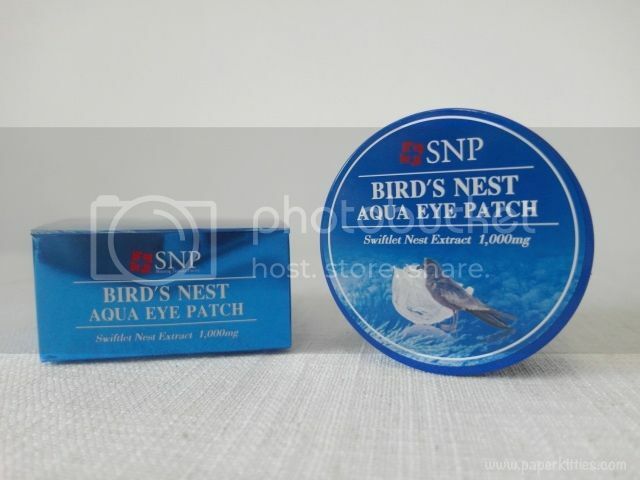 SNP Bird’s Nest Aqua Eye Patch is a hydrogel eye patch that supplies nourishment to your eyes. I’ve always prefer my eye masks to come in hydrogel as not only are they less flimsy to handle, hygrogel also supply nourishment, reinforces moisture and maximise active ingredients of the product it is soaked in. It also comes with a spatula for you to scoop your eye patch without dirtying the rest, how thoughtful and hygienic! Tip of the day: other than using it on your eyes, you can also use it on your nasolabial folds to soften it. Look at how it shimmers! I find this super worth the moolahs, each tub contains 30 pairs of eye patch – a month supply, I reckon it a perfect gift for brides-to-be to used religiously until their wedding day. Hees. I love putting such tubs of eye masks into the fridge as it feels super soothing and cooling after a long day of staring at the computer, and it helps reduces puffiness too! Sadly, the only deal breaker for me here would be that the eye patch doesn’t complement my eye shape. Perhaps my eye is too wide for the patch, so I tend to have a small part of the eye patch poking into my eyes… which can be quite annoying. Otherwise, I deemed it perfect for everyday usage.